Jesse Hagopian wrote this short article for the PBS News Hour about our hugely successful Black Lives Matter Week of Action. Photos by Sharon H. Chang. I don’t think I’ve ever been emotionally moved by a robocall, but there’s a first time for everything. On Sunday night I got a call from my sons’ elementary school. When I answered, the recorded voice of the principal began speaking. She was calling to let all the parents know that the teachers would be participating in the national “Black Lives Matter At School” week, and that parents should ask their kids about what they were learning. The story of Black Lives Matter At School starts with one school in Seattle in the autumn of 2016. John Muir Elementary had been engaging in conversations and staff trainings around equity and race for years. During the end-of-summer professional development, in the aftermath of the police killings of Alton Sterling and Philando Castile, school staff read and discussed an article on #BlackLivesMatter and renewed their commitment to working for racial justice. 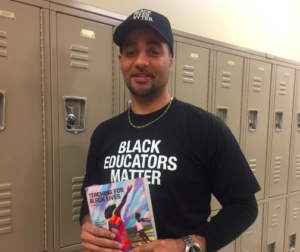 In support of this work, DeShawn Jackson, an African-American male student support worker, helped organize the group “Black Men Uniting to Change the Narrative” for an event at the school to celebrate black students. A backlash erupted when it was reported in the local news that the teachers would be wearing the #BlackLivesMatter shirts. The school began to receive hateful email, and then the unthinkable happened: A bomb threat was made against the school. In response, the school district officially cancelled the event, which made it smaller than it would have been, but the staff carried out the celebration anyway. “The bomb-sniffing dogs found nothing and school was kept open that day. The drummers drummed and the crowd cheered every child coming through the doors of John Muir Elementary,” wrote John Muir parent and education scholar Wayne Au. The staff wore their #BlackLivesMatter T-shirts. A backlash erupted when it was reported in the local news that the teachers would be wearing the #BlackLivesMatter shirts.Members of the Social Equity Educators (SEE), a local organization of which I am part, wanted to honor the bravery of the John Muir educators, and passed a resolution to support them by calling on every educator in Seattle to wear the Black Lives Matter shirts to school on Oct. 19. We worried that when the day actually came, few might be bold enough to publicly proclaim their belief in the value of black lives. Then the t-shirt orders started coming in; first by the dozens, then by the hundreds. Incredibly, over 3,000 educators wore the Black Lives Matter shirts to school, many of them also including the hashtag, “#SayHerName,” a campaign to raise awareness about the often unrecognized state violence and assault of women. That same school year, educators in Rochester, New York, held their own BLM at School day. Philadelphia’s Caucus of Working Educators’ Racial Justice Committee took it to the next level by expanding their action to last an entire week that year. Lessons included restorative justice, empathy, affirmation for trans and queer individuals, black families and black women, to name just some. In 2018, thousands of educators around the U.S. wore Black Lives Matter shirts to school and taught lessons about structural racism, intersectional black identities, black history and anti-racist movements. In addition, the coalition came up with three demands: End “zero tolerance” discipline and implement restorative justice; hire more black teachers; and mandate black history and ethnic studies in K-12 curriculum. This year, the second annual #BlackLivesMatterAtSchool week of action took place Feb. 4 to 8. The NEA Black Caucus and the National Education Association have passed a resolution in support of Black Lives Matter At School. Organizers for the week of action added in a fourth demand — “Fund Counselors, Not Cops” — inspired by the research of the organization Dignity in Schools, which showed that 1.6 million students in the U.S. go to a school with a police officer but not a counselor. In schools across the country, students are participating in a Creative Challenge to answer the prompt artistically, “Schools show Black lives matter when they…” And tens of thousands of students are getting lessons about intersectional black identities and history that are not in their textbooks. Together, we can make school a place where black lives are truly valued. 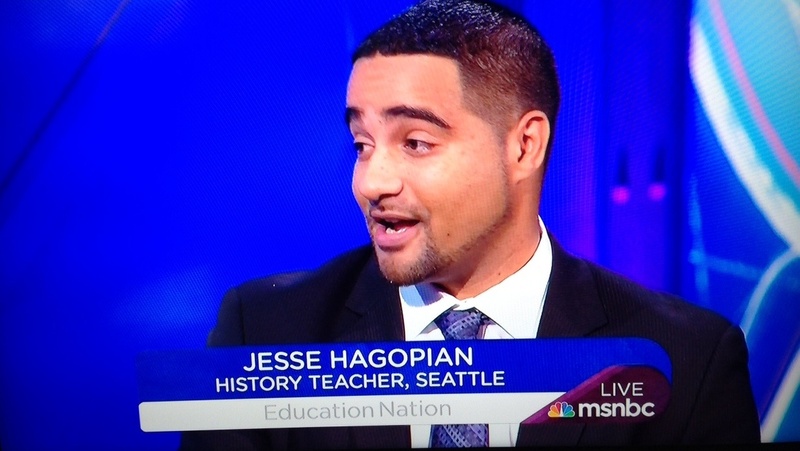 Jesse Hagopian teaches Ethnic Studies at Seattle’s Garfield High School and is an editor for Rethinking Schools magazine. Jesse is the director of the Black Education Matters Student Activist Award and the co-editor of the new book, Teaching for Black Lives. You can follow Jesse on Twitter or on his website, www.IAmAnEducator.com. “….taught lessons about structural racism…” This is a deeply powerful idea. I remember that one of those “whose voice is heard” lessons my American Literature students enjoyed and learned much from was a simple analysis of text books, making a tick mark beside listed categories such as “male” and “female” for every person they saw featured. They did the same for race by researching who had written the stories or poems or articles included in the text, and then comparing the numbers when they finished.